Diving into research and applying that data to training your training can be a daunting task. 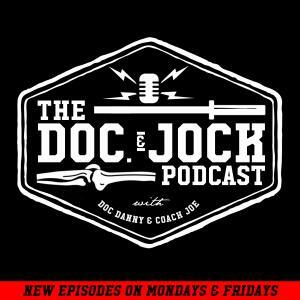 On Episode 186 of theDoc and Jock Podcast Coach Joe catches up with Adam Sayih and Wes Feighner to help you sort out peer reviewed articles and then apply those concepts to your plan. How to the “everyday” weightlifter should train. To catch up with Adam head over to his website The Gentleman and the Meathead or follow him on social media (@gentlemanandmeathead). You can also catch up with Wes on IG (@breabarbellclub). To explore the Speakeasy Club click here.